How to create Wallpapers slideshow? People of all ages ever like customizing their desktop with their favorite Wallpapers collection instead replacing them often with the one from the collection. How to make into a slideshow & moving one as well? 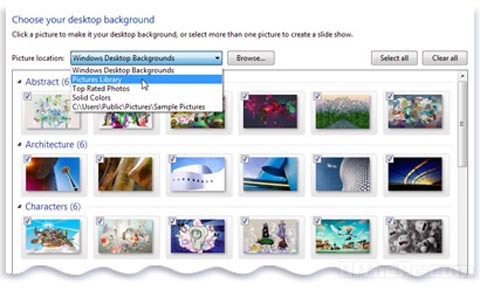 Windows 7 pattern continues with an extensive set of options to change themes, menus, screensavers and wallpapers. by Right clicking on the desktop -> Personalize, Desktop Background (bottom left) that reaches you desktop wallpaper dialog window. Default setting is to take the wallpaper from the Windows Desktop Backgrounds folder. First choose a file location from the Picture Location drop down menu or use the Browse button to customize these settings. The displayable content of the Wallpaper folder appear in the main window & only from here the image is selected to display. Each image has a box at the top left corner, choose one is ticked & if you remove the tick from any image that not needed. The next one is moving screensaver display, Moving images alike screensaver but desktop icons disappear, start menu and applications remains normal. From the Screen Saver Menu in the Personalization dialog box select a screensaver you need and get the name of the one you want to use. It works now, to cancel this stop the process in Task Manager.